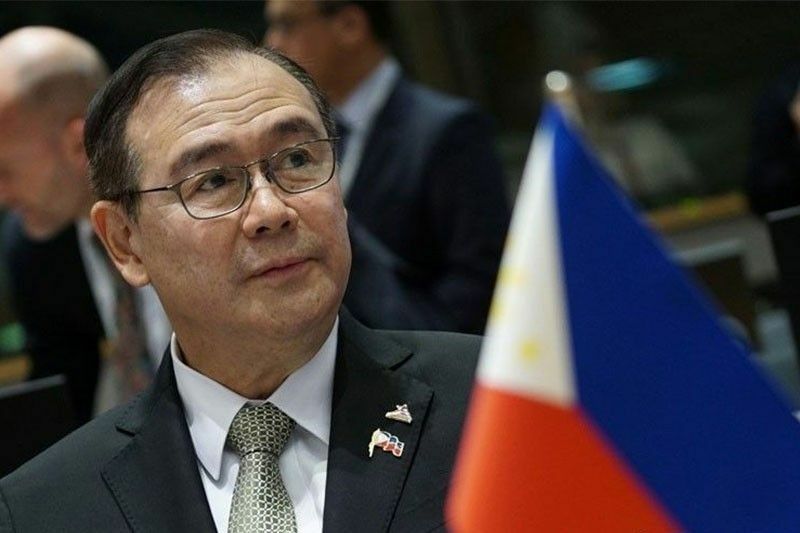 In this Oct. 18, 2018 photo, Foreign Affairs Secretary Teodoro Locsin Jr. represents President Rodrigo Duterte at the 12th Asia-Europe Meeting Summit and EU-ASEAN Leaders’ Meeting in Brussels, Belgium. MANILA, Philippines — The Philippines withdrew its ratification of the Rome Statute—the treaty that established the International Criminal Court—because the Hague-based tribunal supposedly weaponized human rights to defend the illegal drug trade, the country’s top diplomat said Monday. “When the ICC weaponized human rights to defend the drug trade, we got out pronto,” Foreign Affairs Secretary Teodoro Locsin Jr. said during the kick-off ceremony of the 7th Biennial Conference of the Asian Society of International Law. He made the statement a day after the Philippines’ withdrawal from the court meant to prosecute the world’s most serious international crimes took effect Sunday. The ICC has actually not defended the drug trade although the examination was spurred by allegations related to the government's campaign against illegal drugs. According to a December 2018 report on its ongoing preliminary examination activities, the ICC Office of the Prosecutor said it "has been conducting a thorough factual and legal assessment of the information available in order to establish whether there is a reasonable basis to believe that the alleged crimes fall within the subject-matter jurisdiction of the court." It said it has been gathering information from sources that include "publicly available information and information from individuals or groups, non-governmental or intergovernmental organizations." "Consistent with its standard practice, the office has subjected such information to rigorous source evaluation, including assessment of reliability of sources and credibility of information received," it also said. ICC chief prosecutor Fatou Bensouda acknowledged in February 2018 that the preliminary examination—not an investigation—"it has been alleged that since July 2016 thousands of persons have been killed for reason of their involvement in illegal drug use or dealing" but did not defend the drug trade or even drug use at all. "I emphasize that a preliminary examination is not an investigation but a process of examining the information available in order to reach a fully informed determination on whether there is a reasonable basis to proceed with an investigation pursuant to the criteria established by the Rome Statute," she also said then. She said as early as last year that her office will be coordinating with Philippine authorities and also stressed that among the options of the ICC chief prosecutor's office after an examination is to "decline to initiate an investigation if there is no reasonable basis to proceed." Bensouda said last year that "in conformity with the complementarity principle, which is the cornerstone of the Rome Statute legal system and within the framework of each preliminary examination, my office will be engaging with the national authorities concerned with the view to assessing and discussing any relevant prosecution at the national level." She also said: "in the independent and impartial exercise of its mandate, my office will also give consideration to all submissions and views conveyed to it. Again, strictly guided by the requirements of the Rome Statute." Locsin said the country only joined the ICC to accommodate the late Miriam Defensor-Santiago, who was elected judge of the court. The Philippines actually became a signatory to the Rome Statute in December 2000. In 2009, President Gloria Macapagal-Arroyo signed the International Humanitarian Law Bill, the implementing legislation for the Rome Statute, into law in December 2009. The Senate ratified the treaty in 2011. Santiago was elected for a nine-year term as an ICC judge in 2011 but did not assume her functions at the court. In 2014, she submitted her resignation due to her health. The Philippines became the 117th state party to the Rome Statute of the ICC in 2011—a move hailed by human rights advocates as a shining moment for rule of law in the country. In March last year, Manila informed the United Nations that it was quitting the world’s only permanent tribunal that tries individuals for genocide, crimes against humanity and war crimes. The Philippines moved to quit after the ICC launched a preliminary examination into President Rodrigo Duterte’s anti-drug crackdown that has killed thousands and drawn widespread condemnation. An examination is meant to determine if the court has jurisdiction over allegations of extrajudicial killings related to the government's campaign against illegal drugs. Despite the withdrawal, the preliminary examination launched by ICC prosecutor Fatou Bensouda in February 2018 into possible crimes against humanity in the drug war would push through.